Perhaps you have seen one of these at a craft show, but it was too costly. You can make your own Christmas tree wall hanging, using your old costume jewelry or pieces from yard sales and thrifty stores. This is a guide about making a costume jewelry Christmas tree. I make costume jewelry Christmas trees as gifts for family. This one on black background was given to me 30 years ago and made by my 86 year old aunt. It is one of the most loved things in my home. Old family pieces are nice or just collect them at yard sales. They are getting harder to find. Choose the size based on the amount of jewelry you have. I have made some small enough to fit in a 3x3 inch box lid for the tree. Others are 5x7 inches and 16x20 inches. That is up to you. Find a nice piece of cardboard for the back, then glue the fabric to the board with spray glue. Let that dry good. Start with the top of the tree down about 1 1/2 inches for a header space. Then poke straight pins in measuring same space on each side as you come down the tree. Be sure you have a space at the bottom as well, about 1 1/2 inches. I line up several large pieces down the center and lay all of the large pieces out before I glue any. I step back and look at it sometimes for several hours. Then glue them once you like the look. Then go around the edge with small pieces and fill in with small stones or what ever you have. No two are the same. I have made over 30 and hate to part with any of them. Most have been for gifts to relatives using family items they sent me. Dust the item with a piece of tap rolled around your finger. Do not use super glue, it off gasses really badly once the glass is in place and will turn gold black. You can also use buttons and let the kids make them. 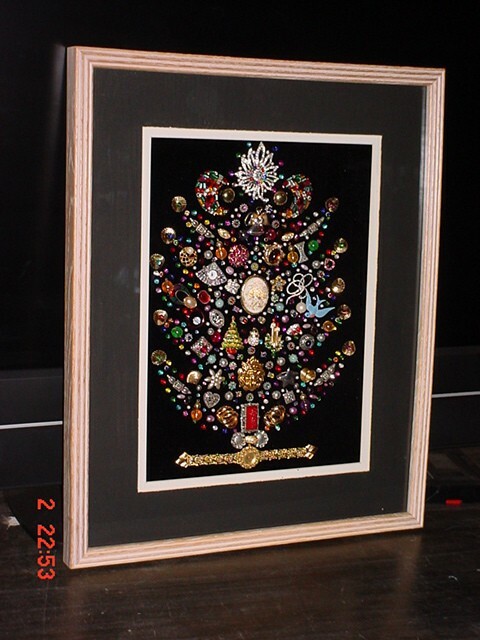 What type of glue do you recommend for the tree or decoration of jewelry on velvet? I do all kinds of crafts and find that "Gorilla" glue will just about do for any project, go to a craft shop and read the label and this way you will find the one need for what you are doing. There is Aleene's Super Fabric Adhesive. All the glues mentioned above have issues in one way or another. If you are making the tree on a board covered with velvet, then glue a gold chain in the outline of your tree, then fill in the outline with the crackled, broken glass of a green wine bottle (specific instructions on how to do this!) and then will be gluing down the heavy vintage bejeweled rhinestone brooches and such, there are only two glues out there that cut the mustard. Is this a Christmas tree kit? I got it at a sale a long time ago. No one seems to know what I have, but I just came across your site! Maybe you have the answer. Thanks! I have known people in the past that made those trees out of old costume jewelry. I have always wanted to make one but never seem to have enough of the right kind jewelry to use. I saw something similar on Antiques Roadshow. It was a sculpture made from old jewelry and other small objects. There was a name for it. I can't remember the name but at one time it was fashionable to make these things from objects that a loved one owned and wore in their lifetime, after they passed on. They are a form of folk art and had a lot of value. I bought costume jewelery in bulk off Ebay and designed and made my own Christmas trees. I have 3 of them. This was popular back in the 30's and 40's. I don't know if there are kits but I think a persons own imagination, a velvet backed picture frame or shadow box, and some junk jewelery makes it good to go. You can even drill holes in the backing and add some Christmas lights through the back, I use battery operated ones. What type of glue do you use to attach the jewelry to the fabric? I want something that I know will stick, but I don't want it to be noticeable. Thanks for your time and consideration. Can I buy a Christmas jewelry tree kit? I have not seen a kit for making the tree, but I am in the process of making one. I bought a green floral cone at the craft store and covered it in dark green velvet from an old pillow. I have been adding sparkly old jewelry, from thrift stores and family, as well as the flat back craft stones. The base will be a wooden block, sprayed gold, and encrusted with more craft stones. I also bought some of the small clear lights with a battery pack at the Dollar Tree. This will, I hope, be a beautiful heirloom project, with very little expense involved. Take a large piece of thin ply board. On the backside, draw a large tree. Drill holes here and there, evenly spaced as you would like them to insert tiny colored lights through. On the front side I glued a large piece of black velvet and make holes where the lights will be placed so they can pop through okay. Where the tree is, glue jewelry: pins, bracelets, pretty buttons, break apart necklaces and bracelets. Use good glue (I can't remember what kind I used but it has to be effective on the jewelry and fabric). Use bracelets as the trunk and base. Be creative. Find a star to use at the top. When I make mine, I always put something to the outside of the tree like a dragon fly, butterfly, bird or something shiny. I will try to get a picture posted later. You can take a large frame. Paint it if it isn't pretty. Here are some pics of my tree I made about 30 years ago and still use. Can I buy a Christmas tree kit. 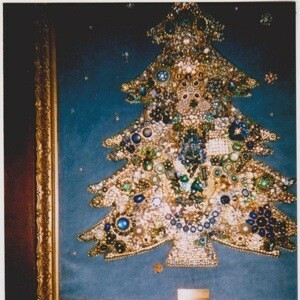 How do I make a Christmas tree out of jewelry? I made two several years ago like the one pictured. It has some special pieces on it like little gingerbread men and some small leaves from the craft store amidst all the beads. These special pieces really made it meaningful to me. The girl scout pin is a great idea, nursing pin or caduceus etc would be neat. Where is your picture. Would love to see it. My friend loaned me a magazine with instructions to make a Christmas jewelry tree and pictures. I lent it to a friend who has mislaid it and can't find it. I don't know the name, but it was a few years old. Can you help with the name of the issue? I would like to purchase it if I can. 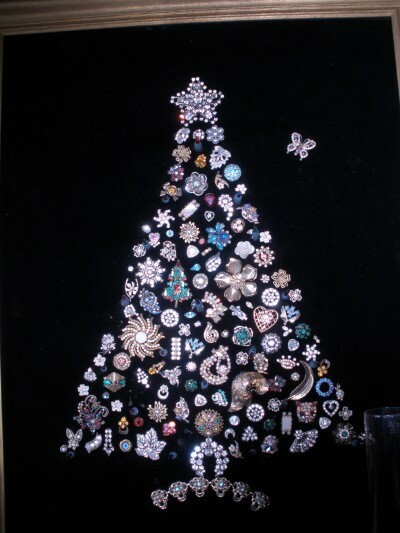 I am looking for instructions for a Christmas tree made out of old jewelry. I have collected the costume jewelry, frame. I am ready to organize the jewelry on the black material. How do I make a tree shape? How do I sew on the jewelry? I have many signed pieces and do not want to cut them or glue them onto the fabric. Thanks for your help. 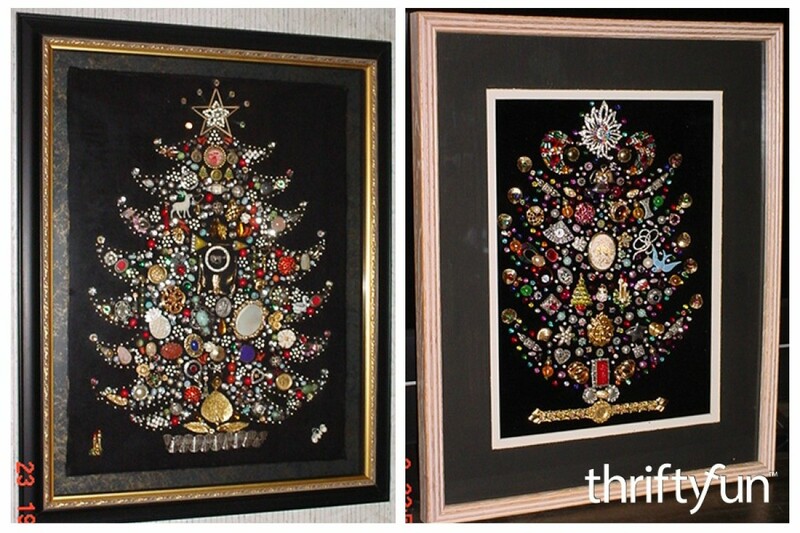 during the holidays you can get a felt tree from the Dollar store, I attached mine to a piece of framed canves, added my old vintage jewlery, and then filled in with pearls, crystals, and tiny white lights. 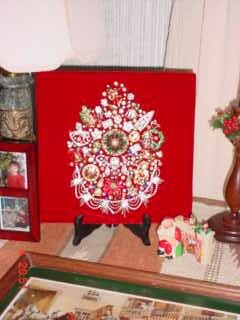 I am looking for information on making a vintage jewelry Christmas lighted picture frames. Years ago, my grandmother had a lot of junk jewelry around. 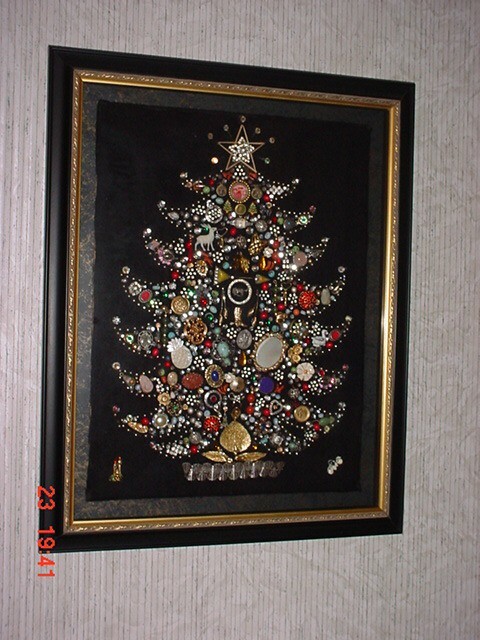 Using a desired pattern (Christmas tree for example), she painted the frames, covered them with felt, added wood to the back of the frame (so it stood out from the wall), drilled holes through the pattern, and added tiny Christmas lights from the back. The lights were also the reason for it not to hang flush against the wall. Finally she put some type of hanger on back of frame. They look beautiful during the day and even more lovely at night when the lights are turned on. Does anyone have this pattern or directions for making these? Also do you have other crafts that can be made out of junk jewelry? I am trying to locate a pattern for a costume jewelry Christmas tree. I have spent hours on the web and still cannot find one. Can anyone help me? You really don't need a pattern. If you have a nice shape for a tree, whether it is the kind that have the points of the limbs straight down or pointed it, simply get a piece of thin board. I used to cover mine with red felt, velveteen, or sateen (fake satin). Then you put your pattern on it, draw it, and place your jewelry on it. If you have sets, like earrings, it's fun to place them on the same points on each side of the tree, or if your pieces are all different, you can put the larger ones in the middle and the smaller ones on the tips of the trees. Shiny ones work wonderfully, and the best glue is E-6000. Take off the earring backs, pin backs, or anything that keeps the pieces from being as flat as they can be. 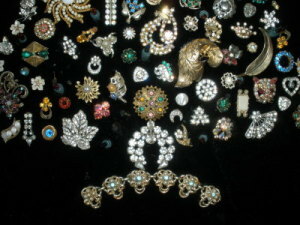 I am looking for a Christmas tree wall hanging made of costume jewelry. If any one has one I would appreciate a picture. Thanks. Some of the pictures will show a larger view if you click on them. I am looking for directions on how to make a memory or Christmas tree out of jewelry. It uses one of a kind earrings or old jewelry that is not being used. One year I found this hideous wooden Christmas tree decoration. It was green. I just glued miscellaneous junk jewelry and now it is my only Christmas tree. After using brooches earrings and such for ornaments, then I used pearls, chains, and bracelets for ropes, dangle earrings are placed on the tips of the branches. If you have a handy man, get him to cut out the design you want. 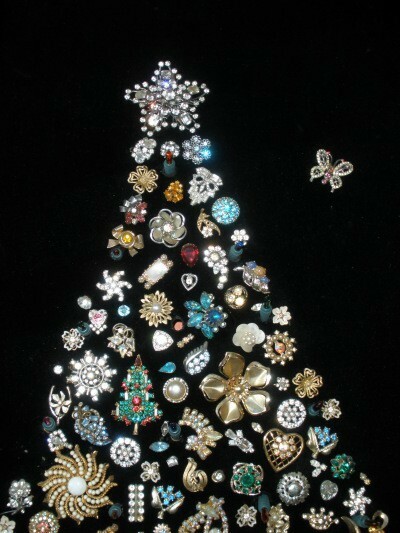 I want a pattern to make a cone shaped Christmas tree out of old costume jewelry. 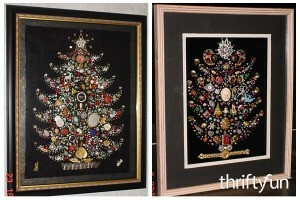 Does anyone have the old pattern for a junk jewelry Christmas Tree Picture wall hanging? You place in picture frame with small lights inserted from back and hang as picture during Christmas. My mom has some great vintage costume jewelry from my grandmothers. She wants to make velvet covered Styrofoam Christmas trees with jewels and beads adorning them for gifts for her daughters and granddaughters next Christmas. How do you make these?